Amarnath Yatra 2019 Online Application Form is being receiving now from March those who want to go Amarnath Yatra in 2019 they know that Barfani Baba registration and issue of Shri Amarnath Yatra 2018 Permits (YPs) will be done on first come-first-serve basis (Pehley aao pehley paao) in Hindi. The Registration of Yatris shall commence from all the Punjab National Bank, Yes Bank, Jammu Kashmir Bank Branches from Wednesday the 1st March, 2017 onwards by Helicopters, Bus, Train or Khacchar. Amarnath Yatra Registration 2019 Medical Certificate Form: Latest News 5 April Every Yatri will have to submit Application Form and Compulsory Health Certificate (CHC) to obtain Yatra Permit for the Yatra. The Formats of the Application Form and CHC, and the list of Doctors/ Medical Institutions authorized to issue CHC are available at SASB’s website www.shriamarnathjishrine.com. Below is Shri Amarnath Yatra CHC Certificate for Breathlessness, Respiratory/ lung ailment, High Blood pressure and Joint Pains etc. Name of the Posts: Amarnath Yatra Application Form 2019. Eligibility Criteria: Each Registration Branch has been allotted a fixed per day/ per route quota for registering the Yatris. The Registration Branch shall ensure that the number of Yatris registered does not exceed the allotted per day/ per route quota. Application Fees: Registration of Rs 500/- per Yatri (to be deposited in the Punjab National Bank: Swift Code: PUNBINBBJTS, Account Number 0794000101212056). Permit Form: Banks will invariably provide receipt to intending pilgrim against the amount of Rs 50/- per pilgrim received as cost of Yatra Permit Form. Yatris to indicate their mobile number, Aadhaar Card while filling the Yatra Permit Forms. Compulsory Health Certificate : Compulsory Health Certificate should have been issued by National Health Services of the country concerned after 1st Week of April, 2019. 1. For Registration/ obtaining Yatra Permit, an intending Yatri shall have to submit filled-in prescribed Application Form and Compulsory Health Certificate issued by the Authorized Doctor/ Medical Institution. Bank Branches: The Registration for the Yatra 2018, through all the nominated Bank Branches will commence from Wednesday the 1 st March, 2018.) it is mandatory to issue “Nirdeshika”, a small booklet containing Dos and Don’ts provided to banks with each Yatra Permit Form, free of cost. Important Dates: The Registering Branch may register the Yatris after the normal banking hours, between 3 PM to 6 PM. 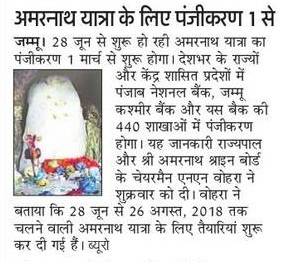 Amarnath Yatra Start From: 29th June 2019. Routes: The distance and time taken for journey up to Holy Cave by two routes. The formats of the Application Form and Compulsory Health Certificate are also available at Shri Amarnathji Shrine Board’s website, shriamarnathjishrine.com. d) Name of next-of-kin of applicant-Yatri, to be contacted in case of any emergency.